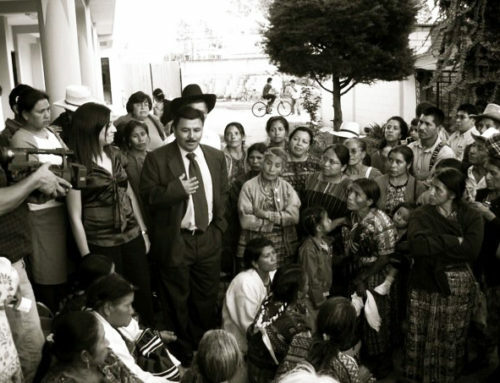 In 1999, the UN-sponsored Commission for Historical Clarification presented its report, Guatemala: Memory of Silence, which documented the crimes the Guatemalan state had committed against its own people during the Internal Armed Conflict. 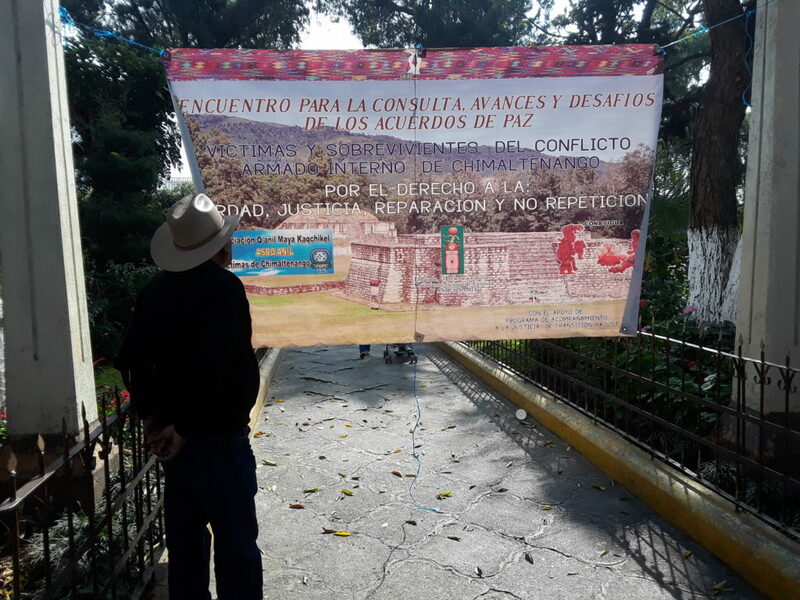 Each year, communities around Guatemala remember what they survived and those they lost on the National Day of Dignification for Victims of the Internal Armed Conflict. This year, as in years past, NISGUA accompanied various survivor organizations as they honored the Day of Dignification for Victims. We share these lessons learned as we mourn the dead, accompany the survivors, and organize for a future without genocide. 1. The struggle for historical memory started with the elders and will continue with the youth. 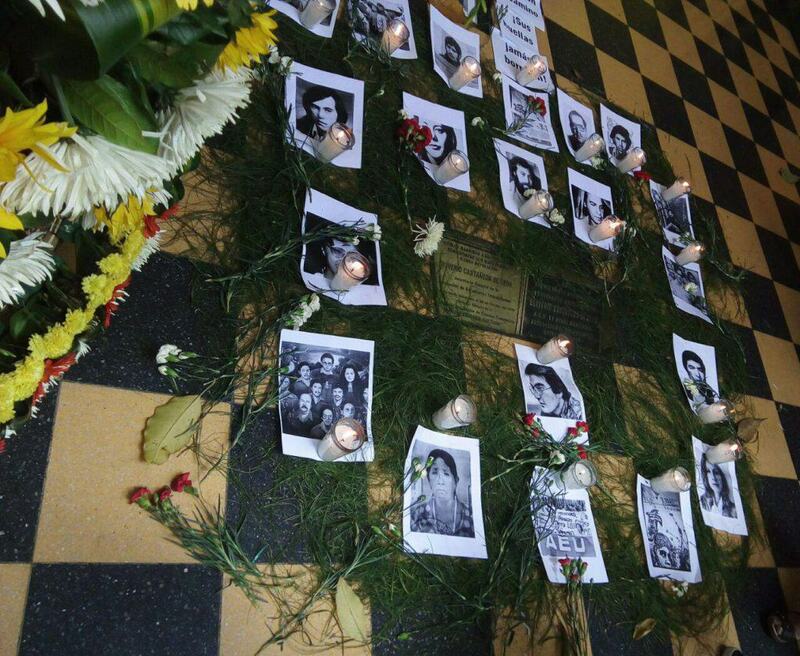 Pictures of disappeared people are placed with candles around a plaque marking the site where student organizer Oliverio Castañeda de León was assassinated. 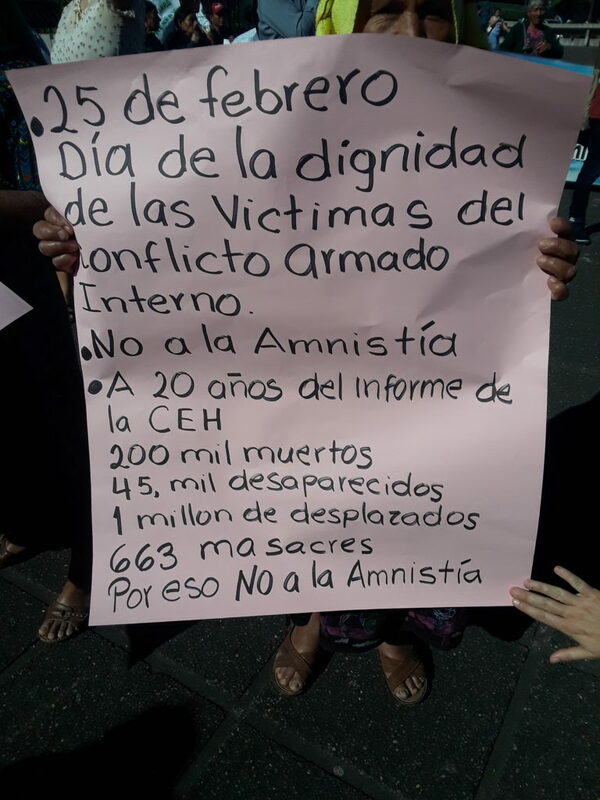 Participants in the march against the Amnesty Law in Guatemala City hold up signs as they march towards the Congress. 2. 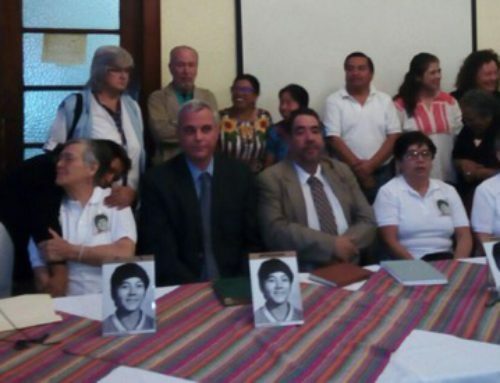 The proposed Amnesty Law is a new and serious threat to progress made in transitional justice. 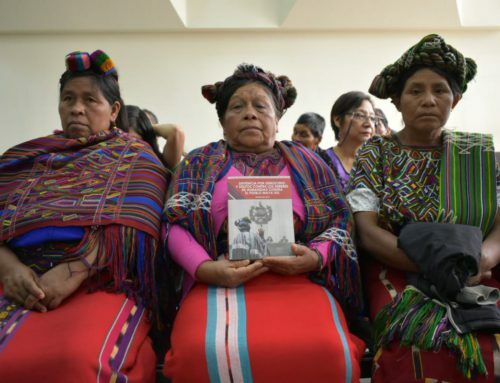 As they have tried before, the Guatemalan Congress is moving closer to legislating impunity for crimes against humanity, sexual violence, forced disappearance, and genocide. A proposed amendment to the National Reconciliation Law would allow amnesty for crimes committed during the Internal Armed Conflict. It would also halt investigation and prosecution of multiple open cases, and would free people awaiting trial or already convicted within 24 hours of a judge granting permission. 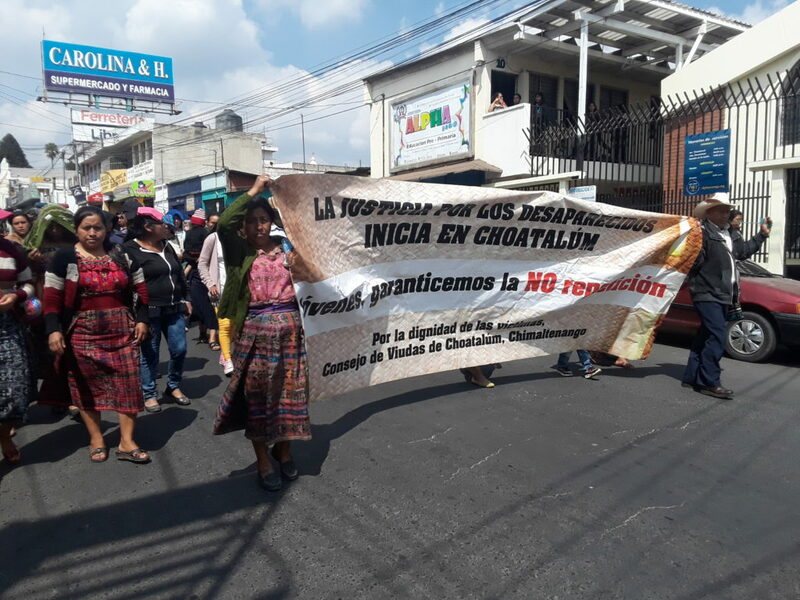 Survivors across the country are mobilizing against this new threat with protests in Guatemala City, Chimaltenango, Nebaj, Cobán, Chisec, and more. 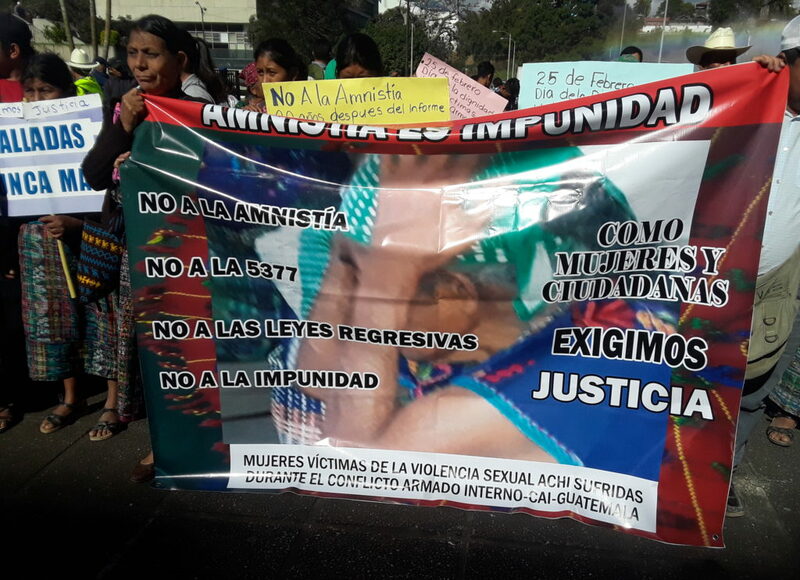 Maya Achí sexual violence survivors, already leading a court case against their attackers, filed an injunction to contest the amendment’s legality. 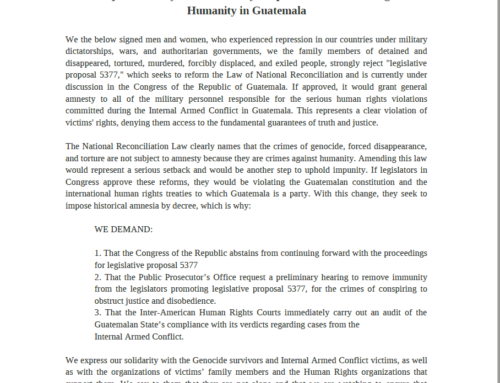 Guatemalan organizations, including NISGUA partners CALDH and HIJ@S, spoke out, releasing statements and a sign-on letter demanding survivors’ rights to truth and justice. 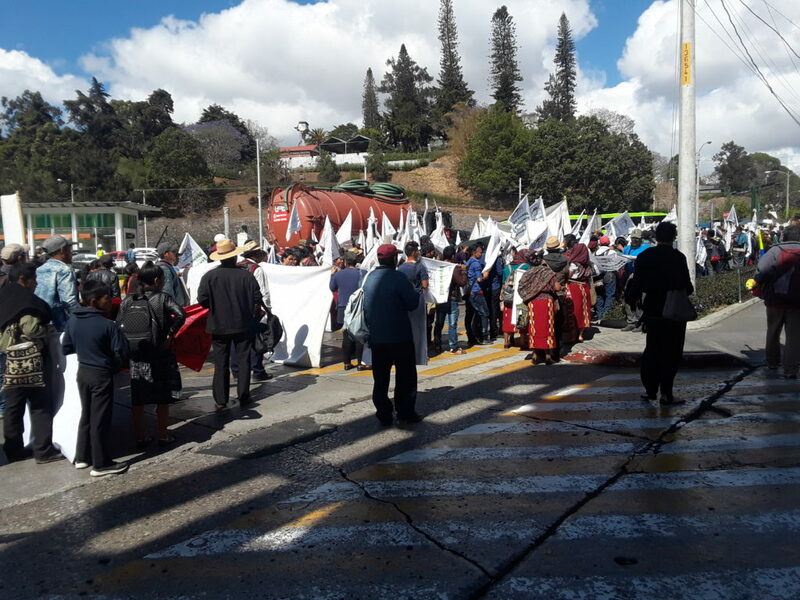 The march against the Amnesty Law in Chimaltenango began at the city’s statue for Dignification of the Victims of the Internal Armed Conflict. 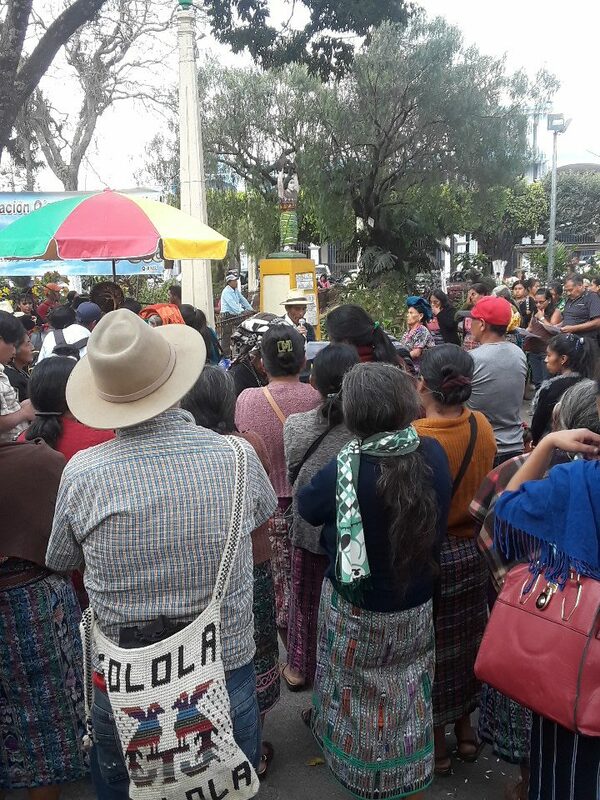 Protestors gather outside of the Chimaltenango government building to deliver their demands for justice to the governor. 3. Impunity for crimes of the past allows for crimes of today. While survivor organizations have made tremendous steps forward in legal and communal justice for crimes of the past, many who supported, financed, and benefited from state violence have not faced consequences. 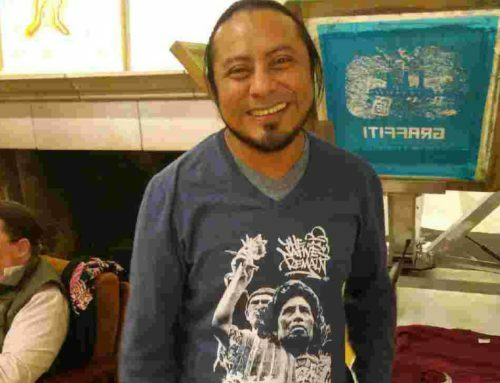 Their massive economic, political, and military power in Guatemala has largely allowed them to escape a public reckoning. 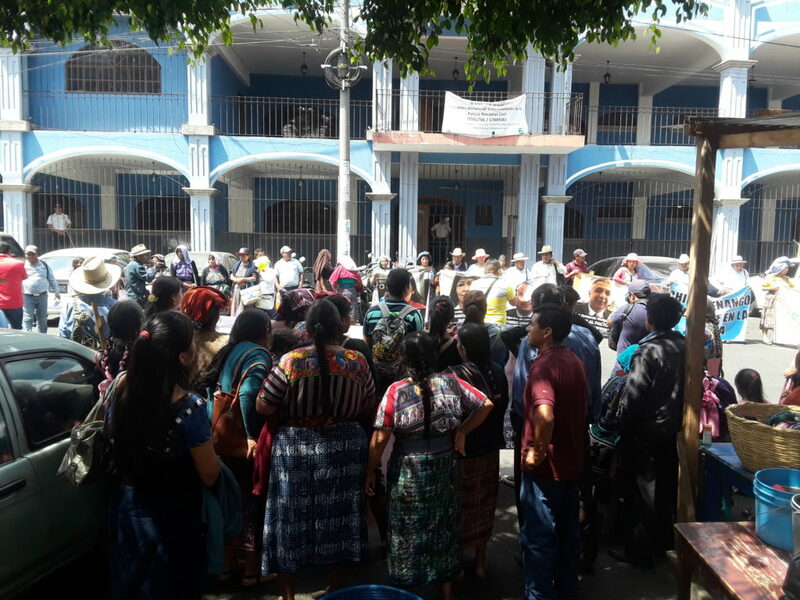 With the support of the US government, neoliberal policies, and multinational corporations, members of the Guatemalan oligarchy continue to destroy Indigenous homes and lives through natural resource extraction projects. 4. The international community must stand with survivors in this crucial moment, and for the long haul. “It’s very important for the international community to know about what is happening in Guatemala because Guatemala is lost, there are very few of us left fighting for justice and the powerful want to do whatever they want with us, because they already did all the horrible things that they wanted to do to us in the past,” says Martina Bar Sunun, genocide survivor and first spokesperson on the AJR board. 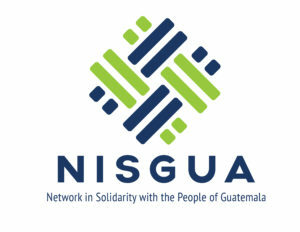 As NISGUA, we stand with survivors in taking a hard stand agains the Amnesty Law, and we recommit ourselves to accompanying them for the long haul in their struggle for justice. There have been seemingly insurmountable obstacles in the past, and there will be again in the future. Inspired by their hope and commitment, we urge you to take action today to protect truth and historical memory. Say no to amnesty for crimes against humanity today! 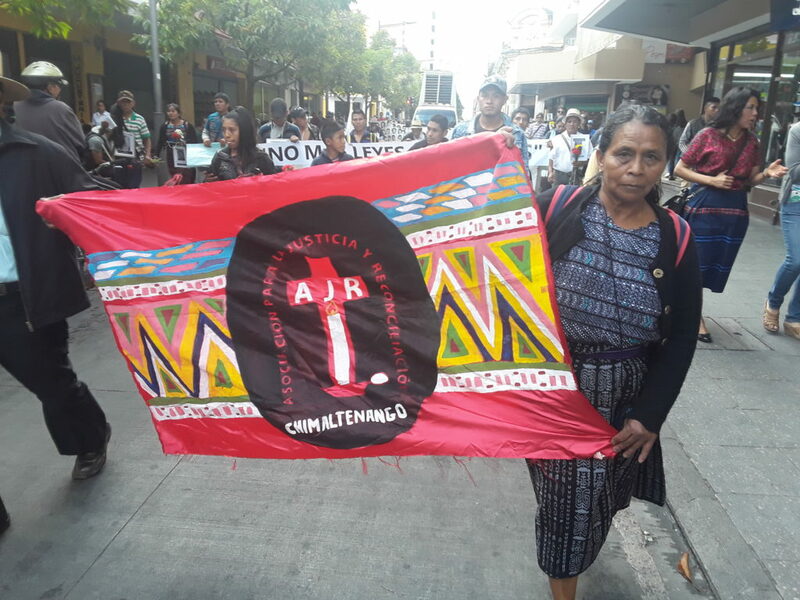 Martina Bar Sunun, first spokesperson for the board of the AJR, marches with a sign representing the AJR.